Remember when I last blogged about the Peruvian-Japanese Tira.D.Toss? Well I recently went back a second time, and sadly, don’t think I’d go back for a third. I gotta say, the food there rates at least a fine in my book (pretty good! ), so it’s very unfortunate that I wouldn’t return. But the service is just… so… slow… ! I went with four others this last time, for a total of five, and our meal lasted just as long as the first. That is, nearly two hours! Now, before I banish Tira.D.Toss in my book forever, let me at least share what I ordered this past visit. 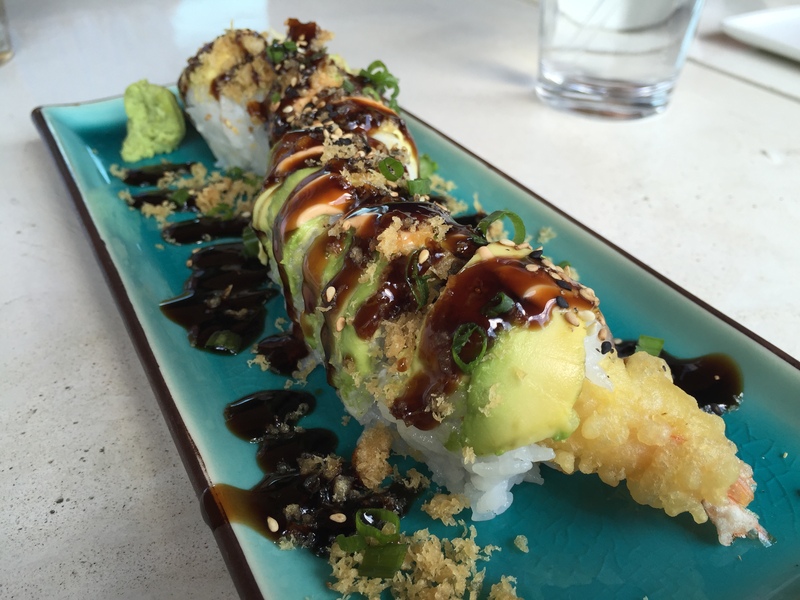 I present to you… the Black Dragon, described as “shrimp tempura, cucumber roll with Japanese snapper topped with avocado & eel sauce.” At least that’s what I attempted to order. Sounds delicious, right? I was especially looking forward to the Japanese snapper! Sounds exotic. Tira.D.Toss. (It’s the name of a restaurant.) How would you pronounce that? Well, it took me a couple tries, but I finally realized that the restaurant’s actually named after tiraditos, Peruvian dishes composed of raw fish. Accordingly to Wikipedia, tiraditos are representative of the influence of Japanese immigrants on Peruvian cooking! Learn something new everyday, huh? Anyhoo, I usually get pretty excited about fusion restaurants, and this one’s been on my list for a few months now — ever since I read some good reviews about it and saw its eye-catching website — so I was happy to finally check it out! As you probably guessed by its namesake, this restaurant serves a combination of Peruvian and Japanese cuisines. I would have to say, Tira.D.Toss doesn’t have the most economical menu from a price standpoint, but the descriptions looked good, so I was willing to give it a shot. Right before I left on my cruise to the Eastern Caribbean two Saturdays ago, I got to see my friends Tia and Chris, who were visiting from Chicago, and we grabbed dinner at De Rodriguez* on Miami Beach. Latin Fusion, woo! It’s been a while since I’ve been to a fusion restaurant. We were originally planning to go for the Miami Spice menu, but learned upon arrival that that particular menu wasn’t available on Friday evenings. D’oh. Oh well. I ended up ordering two starters instead of a main entree because they sounded more interesting than the entrees. First, Pork “Frita” Sliders. These were far from extraordinary. In fact, they were very very ordinary, both in taste and in aesthetics, though I did enjoy the little crispy potato fries — I forget what they’re called — inside the sandwich. These sliders were tiny — and they came out to be $6 each! Overall rating: below average. 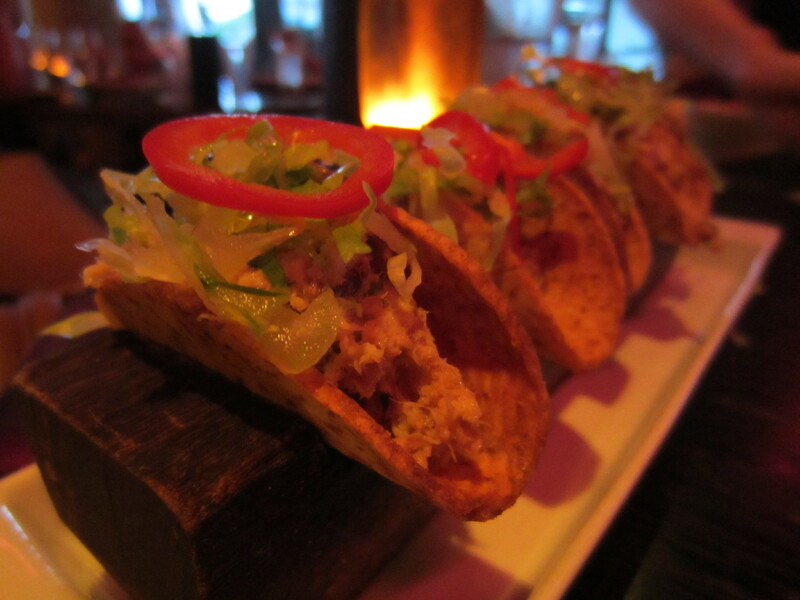 Second, Smoked Marlin Tacos, rum-marinated smoked marlin in a crispy malanga shell. Intriguing description, right?! Sadly, they actually sounded better than they tasted IMHO. I was amused by the festive presentation of the tacos, but they turned out to be slightly less flavorful than I was expecting. And I think the malanga shell actually diminished instead of enhanced the flavor of the marlin. Pity. Pity indeed. I think I might rate this one an okay-fine, for the novelty factor. New restaurant! And this time, new genre too — Italian American fusion! I don’t think I’ve been to a restaurant that mixes those two specific flavors, so I was pretty excited to check out Divieto*. The ambiance in the restaurant was very nice — vintage, yet modern — so we decided to forgive and forget that the original Executive Menu was unavailable, move on with our lives, and order something else from the current menu — of course still with the hope that we’d be able to ration our meals. Turns out that not only would we not be able to ration, but the lunch special portions weren’t even really enough for one full meal. Fail #2. Keep reading, it gets better. 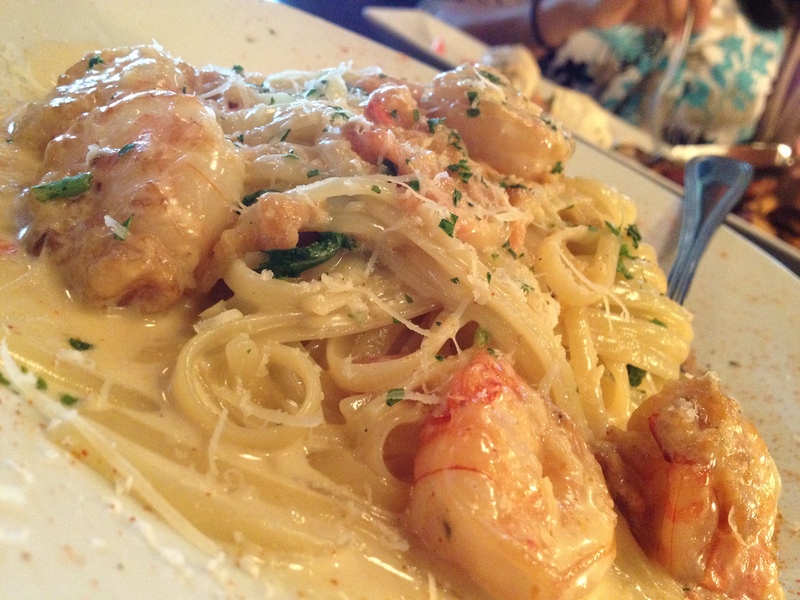 I ordered the Shrimp Bistro, essentially linguine in lemon sauce, with shrimp, tomato, and arugula. Pretty delicious, flavorful. Fine. The waitress had introduced it as a “special,” so thinking she meant lunch special — logical, since we had just asked about those — I went ahead and ordered it, along with a house salad. (Lunch specials are supposed to come with either soup or salad.) 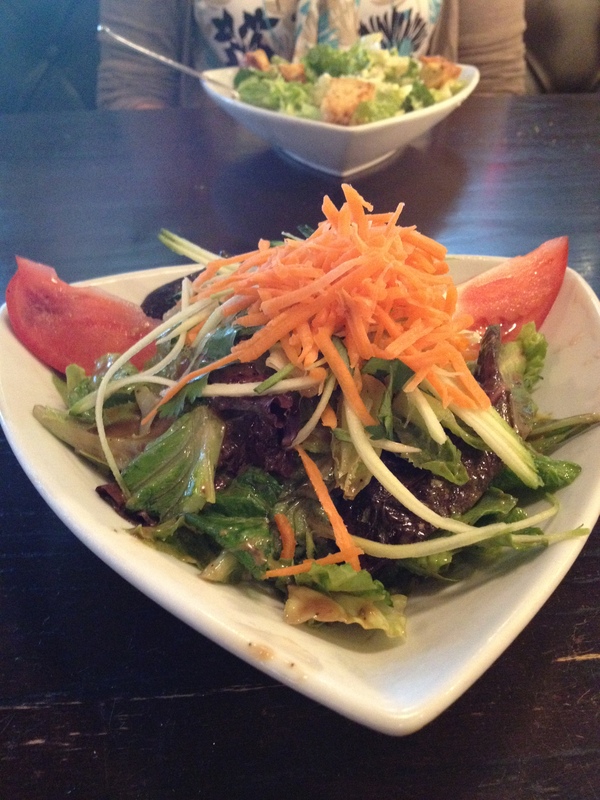 Come bill time, I was unpleasantly slapped (again) with a $3 surcharge for the salad! Apparently “special” does not mean “lunch special.” Uuugh… Fail #3. Though this culinary adventure might sound like an overall fail, at least we accomplished trying something new. I actually enjoyed the taste of my meal — though not so much the cost — so I suppose I could be convinced to go back again… but next time, I’d want to first inquire about the current Executive Menu! 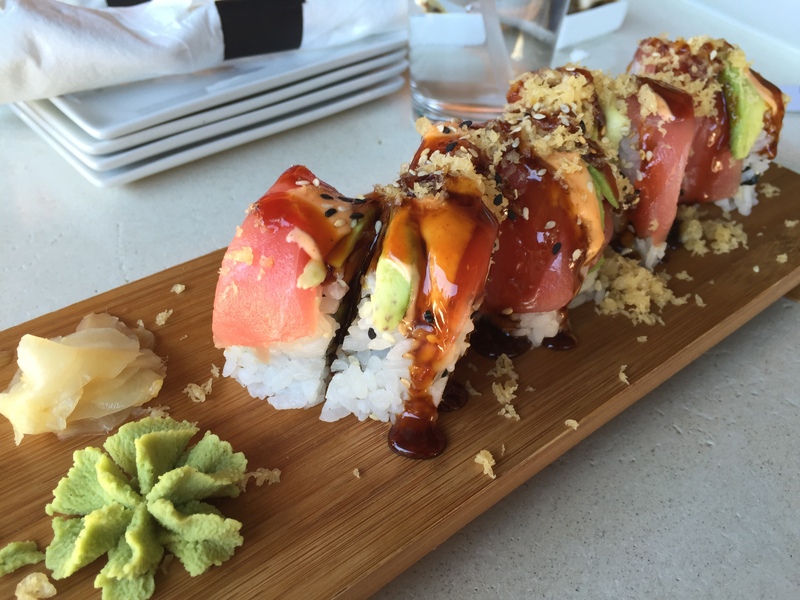 Try any interesting fusion restaurants lately?